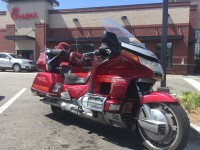 Looking to replace our 1993 Goldwing asencade cb radio, anyone give me ideals on where to shop for this. Have looked at J&M JB aND AMAZON cant seem to find the one I need. I found one on ebay last year. I can't remember what I paid for it but, it was way less than any other I found. Try any M/C salvage companies you can find. Was looking on ebay today under cb radio for motorcycle and kept getting all the other radios. How did you look for it on ebay? Search for 'GL1500 cb'. There are many listings for other stuff. Just keep scrolling. You'll find them. Mostly about $100 to $200. I just looked and there were about a half dozen, various conditions/prices on the first 3 pages. Some state for parts only but, you would have to communicate with the seller to insure proper working condition.